Not too much has been going on since Debbie’s health crisis. Most of the time weekends are spent just running errands and resting up for the next work week. That’s probably why I jumped at that chance when a friend of ours invited us to join them and another couple for a weekend of local camping. At first, Debbie wasn’t too keen on the idea. She thought it was a waste of money for just a couple of days at a campsite five miles from our house. I didn’t see it that we haven’t done anything for the past couple of months. It was time to just get away and see something else and RELAX with good friends and the outdoors. Since it was only for a weekend I thought renting a Class A wasn’t necessary so we rented a Class C instead. I was surprised when I picked it up that it was only five feet shorter then the FR3 we rented in the past. It was a lot easier to drive and reminded me of a big U-haul truck. It’s a perfect size for a weekend getaway. Since we’ve already been on two long trips, our RV supplies and equipment are all in containers which makes setting up the RV a breeze. We picked up the RV on a Friday morning and by that afternoon we were heading to the campsite. Our friends, Debbie and Sal made the reservations for all of us and were already set up when we arrived at Turkey Swamp Park. With three sites in a row, Debbie and Sal was in the first spot and we chose the third spot. Jim and Kim, who arrived a couple of hours later, got the middle. 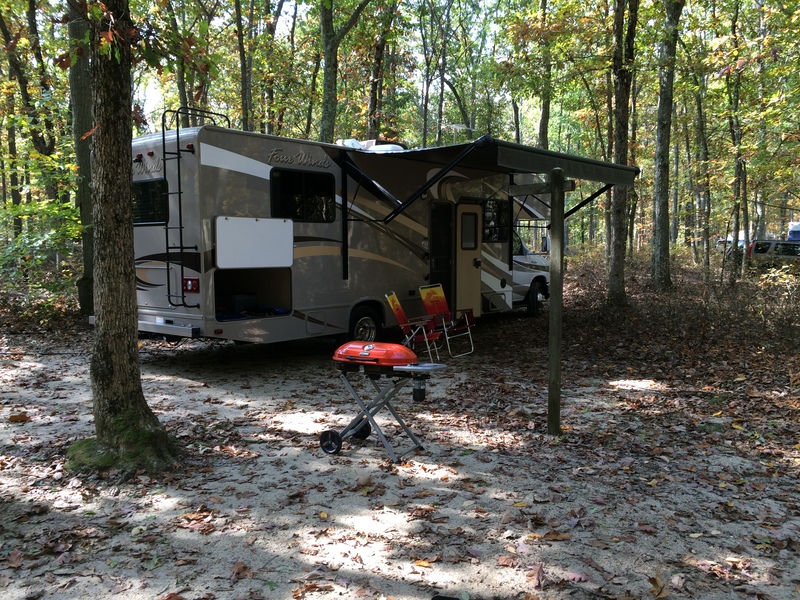 Debbie and Sal have a Class A and really had a great campsite set up. The had a 10×10 square canopy over the picnic table with string lights and lanterns, outdoor radio, and an awesome outdoor kitchen/grill area. Debbie also cooked dinner for everyone both days. They’re really great people. 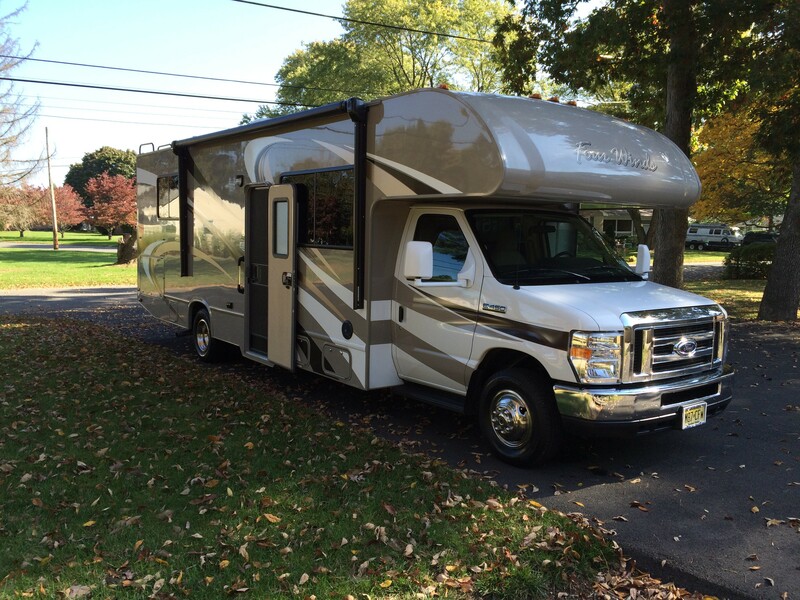 Jim and Kim have a hybrid travel trailer, and like Debbie and Sal, are seasoned campers. They also had a great set up and brought kayaks and bicycles that Kim and their son Ryan used on the lake and trails. They’re also great people and long time friends of ours. It was really good to see how other people set up their campsites and I learned a lot in the short time we were together. Once the festivities started we were having so much fun and never thought about taking pictures. Next time I’ll try to remember to take some on the iPhone. Sunday morning came too soon and after breakfast everyone started breaking down their site to head home. We had a really great time and Debbie said on the way home that she changed her mind and it was worth every penny. Time to change the plan?